(WDVA Release) Washington residents are invited to pay tribute to veterans of the Korean War on Saturday, July 26, as veterans groups gather in Olympia to remember the 55th anniversary of the end of the Korean War. A special wreathlaying ceremony will be held at 11:00 a.m. at the Korean War Veterans Memorial on the East Capitol Campus. All organizations and individuals are welcome to bring flowers and/or wreaths to place during the ceremony. This event marks the15th anniversary of the dedication of the Washington State Korean War Veterans Memorial. or call 1-800-562-0132 option 1. The Korean War lasted three years, from June 25, 1950, until a cease-fire was signed on July 27, 1953. More than 500 Washington residents lost their lives while serving in the U.S. Armed Forces during this conflict. Defense Secretary Gates announced on July 9, 2008 that the Air Force would rebid the refueling tanker contract. As details on the new process become available, Congressman Adam Smith will continue to remain vigilant in his quest to ensure that the selection process is transparent, fair and takes the true cost of development and long term operation into account. “The Pentagon made the right decision – and the only reasonable one – to correct the Air Force’s mistakes and re-compete the tanker contract. The GAO’s investigation made clear that the original acquisition process was unfair and disadvantaged Boeing’s bid in several respects. I hope this will mean that Boeing and our Washington State workers will get a fair shot at the new contract, but I’ll be watching this new process carefully to make sure that’s the case.”Adam said. As you may know, on June 18, 2008, the Government Accountability Office (GAO) upheld Boeing Corporation’s appeal of the Air Force’s tanker acquisition process for the $40 billion KC-X aerial refueling tanker contract. In addition, Adam signed a letter to the Acting Secretary of the Air Force asking him to implement the recommendations of the GAO, including re-opening discussions with the bidders and revaluating revised proposals in order to make a fair and impartial decision. Adam is pleased to announce that he secured $8.6 million in funding to build a new cyber-warfare facility at McChord Air Force Base. The funding was approved on June 24, 2008, by the House Appropriations Committee. The $8.6 million will fund the construction of a state-of-the-art training and operational facility for the 262nd Information Warfare Aggressor Squadron (IWAS) at McChord Air Force Base. The facility will house classrooms and multiple, highly secured computer networks, and a Sensitive Compartmented Information Facility (SCIF) for the storage of Top Secret information. A new facility is urgently needed, as the current facility is a Korean War-era building without adequate space or security protections. The work of the 262nd IWAS involves a range of cyber-security missions, including replicating the cyber-attack capabilities of potential adversaries to the U.S. The capabilities of the 262nd will benefit significantly through the construction of this new facility. While the Appropriations Committee’s approval of the funding is a positive step in the process towards securing federal funds, the bill must still pass both the House and Senate before becoming law. On June 26, 2008, Adam addressed the House and paid tribute to the 4thBrigade-2nd Infantry Division, a Stryker Brigade from Fort Lewis that returned from a 15 month deployment in Iraq on June 30th. On July 9th, 2008, Adam helped pass House legislation to expand housing assistance and supportive services for homeless veterans. H.R.3329, the Homes for Heroes Act, which Adam cosponsored, overwhelmingly passed by a vote of 412-19. “It is an absolute shame that after years of faithful service to their country, thousands of veterans spend their nights sleeping on the streets or are under the constant threat of becoming homeless. We must do more to support these individuals who served their country. The legislation passed today is a step in the right direction to ensure these heroes receive the support and services they need,” Adam said. · Directs HUD to provide at least 20,000 rental vouchers a year for homeless veterans. · Establishes the position of Special Assistant for Veterans Affairs within HUD to coordinate and oversee the Department’s assistance programs for veterans. · Requires HUD to submit a comprehensive annual report to Congress on the housing needs of homeless veterans and the steps HUD has taken under the programs provided for in this bill. Adam applauded the recent release of Readiness and Environmental Protection Initiative (REPI) funds by the Air Force for the purpose of purchasing more land that is privately held within McChord’s north runway Clear Zone. Statistically, this area has a greater risk of aircraft accident than any other around an airport. “Keeping this area free of development is a safety issue that has needed to be addressed for decades. I am pleased that my office, working in conjunction with the local, visionary coalition formed last year, has beenable to move the issue forward,” said Adam. $1,080,000 of REPI funding will be combined with $500,000 from Pierce County, $150,000 from the city of Tacoma, $250,000 from McChord Air Force Base, and matched with $580,000 from the State of Washington’s Military Communities Infrastructure Projects grant program to buy fee-simple title or development rights on parcels of land located within the Clear Zone. This effort builds upon funds that were raised last year byPierce County, the State of Washington and the City of Lakewood to get the initiative started. “In addition to increasing safety, restoring the Clear Zone also helps abate a growing encroachment problem. As we saw in the last round of Base Realignment and Closure (BRAC), communities that did not address encroachment issues found themselves at greater risk for closure,” Adam noted. As a member of the House Armed Services Committee, Adam led a coalition of members to increase REPI funding by $21 million over the President’s request in the FY2009 National Defense Authorization Act, and has pledged to work hard to make sure that the progress continues. The late Washington State resident, Elwood "Bud" Link, was honored by the House as H.R. 2245, naming the VA outpatient clinic in Wenatchee as the Elwood "Bud" Link Department of Veterans Affairs Outpatient Clinic, passed unanimously. Adam and the rest of the Washington Delegation signed a letter in May asking that the VA committee schedule a vote on the bill. Bud Link, who passed away in 2003, was a very active veteran inWashington State who helped improve the quality of life for veterans. Also of interest, Adam cosponsored H.Res.1248, a resolution that honors men who served aboard the USS Farenholt. The resolution recognizes the service of the USS Farenholt and her men who served on the Navy destroyer in the South Pacific during World War II. The bill was brought to Adam’s attention by a constituent of the Ninth Congressional District who served on the USS Farenholt. and Uhlmann Motors, and our team is busy contacting others every day." while the soldier recovers, and the families of deployed soldiers. transition back to life in the United States. from this benefit to soldiers based in Washington and Oregon. Lucky Eagle Casino marketing department at (360) 570-5301.
additional information, or visit online at http://www.luckyeagle.com. located at 12888 188th Avenue Southwest in Rochester, Washington. (WDVA Release) - John Lee was unexpectedly honored by the federal VA Secretary, Dr. James B. Peake, at the National Association of Directors of State Veterans Affairs' (NASDVA) mid-winter conference in Washington D.C. The Diamond Award is a prestigious award given by the VA Secretary to individuals outside the federal VA who "support the mission of the VA and by his actions and deeds demonstrates on a daily basis the honor due to this nation’s veterans". This is only the second time in its history, it has been given. John was especially honored in that Dr. Carol Fillman nominated him. He is equally impressed by her leadership as the Regional Office Director; and appreciates the incredible support and relationship WDVA has with the Seattle office and other federal VA partners in Washington State. He feels very priviledged to have received this award. (American Legion Release) - The Freedom Team Salute program, created by the Secretary of the Army and the Army Chief of Staff, has partnered with The American Legion Department of Washington to commend six U.S. Army veterans as a part of a campaign to honor approximately 10,000 veterans from the State of Washington. The ceremony takes place right now, 8 p.m. February 1 in the Spruce Room at the Mirabeau Park Hotel and Convention Center, North 1100 Sullivan Road. “One thing is certain – the time spent in the Army affects a Soldier’s life forever. Freedom Team Salute wants to honor each and every Army veteran no matter where or when they served, or for how long,” said Freedom Team Salute Director Col. David Griffith. Honorees Mike Gregoire, John Lee, Alfie Alvarado, Bill Schrier, Helen Boots and Dale Davis will receive Certificates of Appreciation and Letters of Thanks signed by the Army Chief of Staff and the Secretary of the Army, along with official Army lapel pins. Gregoire, Olympia resident and husband of Governor Chris Gregoire, served a tour of duty in the Mekong Delta of Vietnam as a platoon leader and convoy commander with the Delta Express. Gregoire’s military service spurred a lifelong commitment to veterans’ affairs. He is a member of several veterans’ organizations including the Veterans of Foreign Wars, The American Legion and Vietnam Veterans of America. Lee, of Olympia, enlisted in 1968 and spent 21 years serving in the Army’s Infantry. He served with the 173rd Airborne Brigade in the Republic of Vietnam. After retiring from the Army in 1990, Lee entered the public sector with the Washington Department of Veterans Affairs where he currently serves as the agency’s director. Alvarado, a native of Puerto Rico and resident of Olympia, retired from the Army in 1993 after serving 22 years on active duty. She received numerous awards and decorations, including the Legion of Merit, Order Military Medical Merit and Meritorious Service Medals. She currently serves as the Deputy Director of the Washington State Department of Veterans Affairs. Schrier, of Sedro Wooley, served in both combat and combat support elements for more than 20 years and is an active Legionnaire. The International Hands Across the Border Organization honored Schrier as the Veteran of the Year in 2002. He is serving his second term on the Governor’s Veterans Affairs and Advisory Committee. Schrier also serves as the National Executive Committeeman for The American Legion Department of Washington. Boots, of Cheney, a veteran of World War II, has been an active member of the American Legion and the American Legion Auxiliary for more than 50 years. She served as Legion Post 72 Commander, Auxiliary Unit President and District President. Boots also serves veterans and active duty service members in the Inland Empire. Davis, of Lacey, served as a military intelligence officer for more than 20 years. Upon retirement, he continued to serve the veteran community through his work as an American Legion Veterans Service Officer at both the regional and state levels. He was appointed in 1999 and continues to serve as the State Adjutant for The American Legion Department of Washington. The Army created the Freedom Team Salute program in May 2005 to give the public the opportunity to thank U.S. Army veterans for their service; the commendations recognize the veterans’ support and sacrifice. Freedom Team Salute has honored more than 1 million U.S. Army veterans, spouses, parents and employers around the globe. Those interested in learning more about Freedom Team Salute or who would like to honor a U.S. Army veteran can visit www.freedomteamsalute.com. (Lakewood Release) - At its next regular meeting on Monday, November 5th at 7pm, Mayor Claudia Thomas and the Lakewood City Council will conduct a 30 minute ³Salute to Veterans.² The program will include short talks from veterans and friends and family members of veterans, a slide presentation, recognition of all veterans in the audience, and playing of all service songs. All veterans and friends of veterans from Lakewood and beyond are welcome and encouraged to attend. Light refreshments will follow the program. The Council will then proceed with City business, including a public hearing on the proposed 2008 City Budget. Kudos to the Department of Veterans Affairs in Washington State. Click here. Wearing Medals - Yes or No? First off, I want to thank you/your staff for your fine publication. My coworkers/I read every issue. 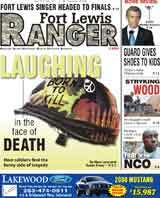 I'm "An Old Vet" amongst others who work at Fort Lewis. MANY of us are Retired/Former Combat Vets/Soldiers/Marines/Sailers,"Blue Suiters" back through the Vietnam era who are "Honored and Proud" to be able to support our deploying Soldiers!!!! Wearing our full "Rack of Ribbons" doesn't seem to fit for some reason. I think it might have something to do with the fact that we are older now and out of uniform. When on active duty, to be sure, every one of us wore EVERY DECORATION for our contemporaries to see and we were eager to see theirs as well. Kind of went with the Territory to check each other out and see what they had done, how well they had done it and where they had been. I think that when we retired, we all felt that we were giving up the right to display our complete/detailed military record/awards and were passing that honor/priviledge along to the younger soldiers who were now fighting for freedom. I don't feel that is a bad or sad thing. I think it shows respect for todays active duty soldiers and rightfully passes along a proud heritage and privilege to them. But, maybe I'm wrong and just an old Fart!! Many of us attend the Veteran's Day Parades and are recognized/honored by people of all ages. Many of us also have been approached at other times throughout the year by people who have noticed our hats OR a decal or license plate bracket on our vehicles. It's truly rewarding---especially for those of us from the Vietnam era who received less than gratifying returns from our countrymen. Again, thankyou for your fine publication. WASHINGTON – To ensure veterans with mental health crises have immediate access to trained coordinators, the Department of Veterans Affairs (VA) will establish a 24-hour, national suicide prevention hot line. “This is another significant step to ensure that veterans, particularly the newest generation of combat vets returning from Iraq and Afghanistan, receive accessible and compassionate care for their mental health concerns,” said Secretary of Veterans Affairs Jim Nicholson. The hot line, which is scheduled to begin operations by August 31, 2007, will be based at the Canandaigua VA Medical Center in New York state. Staffed by mental health professionals, it will operate seven days a week, 24 hours a day. In addition to staffing the hot line, the suicide prevention coordinators will take part in training clinicians and non-clinicians on warning signs for suicide, guide veterans into care and work within facilities to identify veterans at risk for suicide. VA’s Canandaigua facility is already a VA center of excellence focused on suicide prevention, mental health education and research. VA has the nation’s largest mental health program. The Department recently announced plans to provide suicide prevention coordinators at each of its 153 medical centers, joining more than 9,000 mental health professionals. Mental health services are provided at each of VA’s 153 medical centers and more than 900 outpatient clinics. Last month, Nicholson announced an initiative to hire 100 new employees to provide readjustment counseling at each of the Department’s 207 community-based Vet Centers. In July, VA will convene a four-day mental health forum in Washington with the Department’s top mental health professionals to review a wide range of issues, such as integrating mental health services with primary care, combat trauma, suicide prevention and the special needs of the newest generation of combat veterans. Submit your design by August 31, 2007 to heidia@dva.wa.gov (PDF, JPG, Tiff, Word, PowerPoint or mail to WDVA, C/O Heidi Audette, PO Box 41150, Olympia, WA 98504. Design and dimensions may be altered and/or combined. The Governor’s Veterans Affairs Advisory Committee will select the final design. In accordance with SB 5253, WDVA is developing a Veteran Owned Business Registry in Washington State. The attached notice seeks a qualified consultant to develop this web-based registry. Visit http://www.dva.wa.gov/PDF%20files/VETERAN%20OWNED%20BUSINESS.pdf for more information.